Your LinkedIn profile is exclusively yours… you control what’s on it. If you can get it to show up in the search results for your name, you just took control of one more piece of your online reputation. Make sure that your profile is at 100% completion. There is a bar in the upper right hand side that tells you how far you have to go. Ask your network for Recommendations (you need at least 3 just to get to 100%). Get as many as you can. 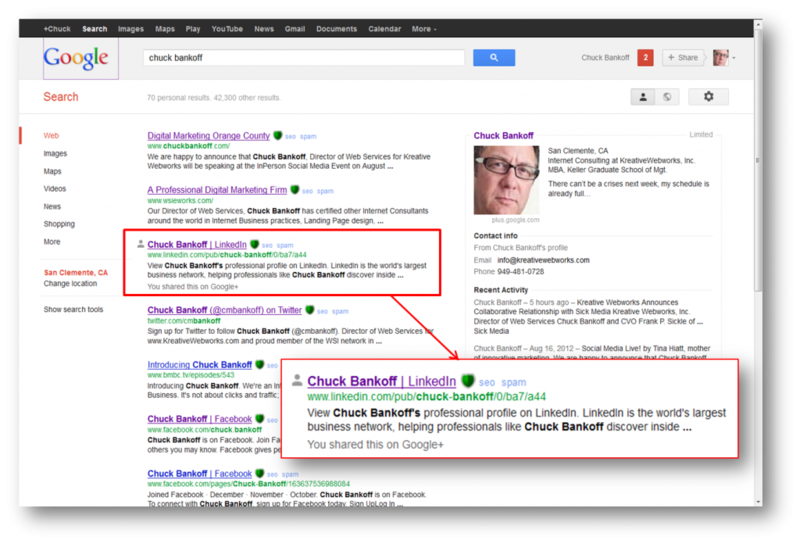 Whenever possible, link to your LinkedIn profile from blog postings, your company website…wherever you can. It’s those incoming links that indicate popularity to the search engines and bolster your search results. Link to it from other social media like Google Plus and Facebook and Twitter. Chuck Bankoff Director of Web Services for Kreative Webworks, Inc. and is a Digital Marketing Consultant, Speaker, Author and Trainer in Orange County California.